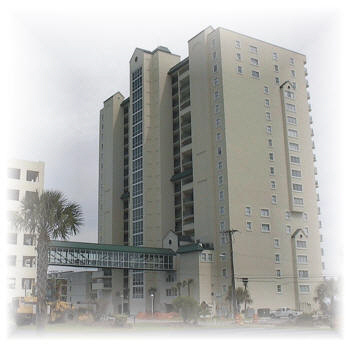 Located in the Windy Hill section of North Myrtle Beach, rising 18 stories above South Ocean Boulevard situated on the Atlantic oceanfront, Windy Hill Dunes is a building of unmatched structural design in North Myrtle Beach. Glass elevators and an enclosed access bridge to off-site covered parking, add to the unique appearance of this luxury condominium development. With a total of 93 villas, Windy Hill Dunes offers 3 and 4 bedroom condos, as well as 15 penthouses with square footage exceeding 3,300 square feet. Features inside include ceramic tiled foyers, kitchens and baths; open and airy kitchens with breakfast bar, refrigerator, dishwasher, microwave, electric range, washer and dryer and disposal. Master baths boast cultured marble tubs, separate showers and double lavatories. For your enjoyment outside, the amenities include an oceanfront pool, lazy river, whirlpool spa and kiddie pool. Exercise and fitness rooms are also available. Shopping, dining and entertainment of all varieties are accessible within a few blocks.